WaveSpectra and WaveGene are two excellent tools for audio testing (and more!) and it's not easy to realise their full ability until you have read the help files. The translations were done with Google translate, so there may be a few sentences that don't make sense on first reading - however I did proof read them and made changes to the best of my ability. You can download a .zip archive of the two files (WG>CHM and WS.CHM) here. In the event that you are unable to install the above WinHlp32 installer, you can simply download a zip archive of winhlp32.exe here. The above installer did not work for me (Windows 7), so I found a working copy of Windows XP and copied 'winhlp32.exe' from there (which is the winhlp32.zip download offered above). After pasting the content of each individual Japanese html help file into Google translate, I was able to extract a fairly good English facsimile. However much of the HTML code was corrupted in the process, so I had to manually edit it by comparing my help files with the original Japanese help file (the images were helpful here as I had no idea what I was reading!). I then used HTML Help Workshop (download from Microsoft) to rebuild the files after translation and editing. I also changed the default font, and generally tidied up some of the HTML (some of which was corrupted by the translation process). Changing the help files to English has 'broken' the context sensitive help within the applications - the workaround for this is to simply open the help file directly by 'double clicking' on it. Trying to access the help from within the applications will result in an error message "hh_help_context called without a map" which I believe is because the context sensitive help was linked using Japanese keywords from within the applications. 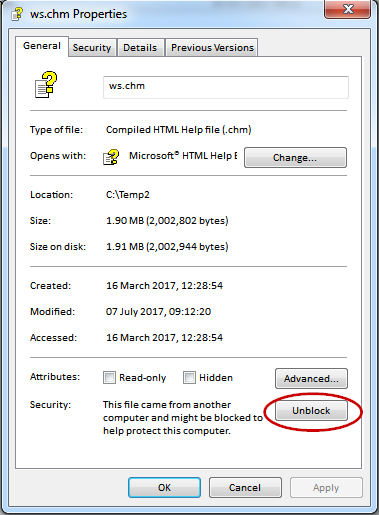 Before you can open the help file, you will need to unblock it on your PC. Right click on the file, click on "Properties" - on the "General" tab you'll see a button marked "Unblock" as per the image below - click "Unblock" and then "Apply"
You will now be able to open the help file.